Wall Street has identified customer experience as a huge opportunity for growth in that organizations who are doing it right are seeing profits soar above those who have not. The key, of course, is understanding how to align customer strategy against the other long range goals of driving loyalty alongside new business. How you get this done is what your peer groups will be debating and discussing at the upcoming Total Customer Experience Leaders Summit. Where to spend - how to spend and how to allocate resources - it's all about making it happen in 2013. 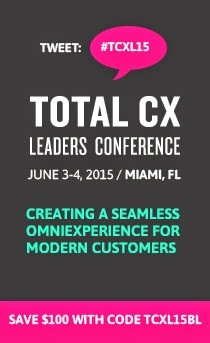 We cover it all at the Total Customer Experience Leaders Summit. Visit our website to download the brochure and view the full program. As a reader of this blog, we’d like to offer you a 15% discount off the standard registration rates, use code TCEL13BLOG. We look forward to seeing you this April in Boston!